American installed a version of Panasonic’s eX2 system on their new Boeing 777-300ER. It supports up to 350 audio selections, 120 movies and 150 TV programs, as well as games, apps, maps, and communication and messaging features. It also offers at least one USB port and AC power outlet at every seat. And if you’re traveling in First or Business Class you’ll also get some additional features, like extra USB ports and more AC outlets, you’ll also have AV ports that that enable you to connect your own devices to the in-flight entertainment system. What this means is that you can mirror your laptop to the IFE screen to watch a movie or work on a presentation, you can connect your iPod and control and listen to its music using the IFE system menus, or view and listen to content stored on your iPad or iPhone. How you do this depends upon what kind of device you have. There are two kinds of A/V input options: composite video with separate left and right audio channels, and Panasonic’s proprietary eXport. You’re probably familiar with composite A/V connections, they’re the three cables with RCA jacks: a yellow plug for video, red for right audio, white for left audio. Many video cameras, portable DVD players, and some laptops have these type of older, analog connections. To connect these type of devices all you will need are yellow, red, and white composite cables or (if your device has a single audio jack) you’ll also need to get a Y splitter to divide the left and right audio channels. Newer devices, like iPads, iPhones, MacBooks, and many Windows laptops have digital video ports, so you’ll need a special cable or converter. S-Video: If your laptop supports s-video out, here’s a S-Video to Composite adapter with left and right audio. VGA: VGA to composite requires more than a cable, it requires signal conversion. You’ll need to get a VGA to Composite converter and you’ll also need to get an audio Y cable splitter with 1-mini plug and 2-RCA plugs. HDMI: If your laptop has HDMI or Mini HDMI you’ll need HDMI cables, RCA composite cables, and a converter like this universal HDMI to composite video converter from ViewHD. MacBook, MacBook Air, and MacBook Pro with Apple Mini Display Port and Thunderbolt: All you need is this adapter from OKEBA. It works with both the Mini DisplayPort and the new Apple ThunderBolt connection and converts to to RCA Composite Video. Includes cables. iPhone thru iPhone 4S: Apple Composite AV Cable with USB connector that you can plug in to a power source. iPad Touch 1st thru 4th generation: Apple Composite AV Cable with USB connector that you can plug in to a power source. iPod classic 80GB – 160GB: Apple Composite AV Cable with USB connector that you can plug in to a power source. iPad Nano 3rd thru 6th generation: Apple Composite AV Cable with USB connector that you can plug in to a power source. iPad 1st thru 3rd generation: Apple Composite AV Cable with USB connector that you can plug in to a power source. iPod Touch 5th Generation: Lightning Digital AV Adapter supports HDMI. You’ll still need to purchase the universal HDMI to composite video converter from ViewHD and cables (sold separately). iPhone 5: Lightning Digital AV Adapter supports HDMI. You’ll still need to purchase the universal HDMI to composite video converter from ViewHD and cables (sold separately). iPad Mini: Lightning Digital AV Adapter supports HDMI. You’ll still need to purchase the universal HDMI to composite video converter from ViewHD and cables (sold separately). iPad 4th Generation: Lightning Digital AV Adapter supports HDMI. You’ll still need to purchase the universal HDMI to composite video converter from ViewHD and cables (sold separately). eXport is Panasonic’s proprietary 9 pin mini-DIN iPod/iPhone port that provides both an audio and video connection while it charges your device. Unlike the composite connection, it integrates with the entertainment system and allows you to control and navigate your iPod or iPhone from the entertainment system menus. To connect to the eXport you’ll need and adapter like this eXport In-Flight Video Cable for iPod and iPhone from Griffin. It doesn’t work with the iPhone 5, iPad mini, or the 4th gen iPad. These devices all have the new Apple Lightning connection rather than the 30 pin USB connection that Apple has used for years. For these devices you’ll have to use a composite connection (at least for now). One of the cool features of the entertainment system is that you can view photos stored on a USB drive. All you have to do is connect your thumb drive using the USB port, the entertainment system has software that will allow you to open and view your pictures. At the media event for the inaugural flight of American’s new 777-300ER I had a chance to visit with Mark Smith, American’s Manager of Inflight Products, and talk about the new in-flight entertainment system on the 777-300ER. One of the interesting things about the Panasonic system is that it’s modular, so as manufacturers come out with new inventions and interfaces, American can adapt the system and add new connectivity options in the future. Something else he mentioned, that I thought was both funny and ironic, was that during the development of the new IFE system he and his team spent quite a lot of time at Panasonic’s facility in California working with their engineers (in fact one of the AA team members spent more than 150 days out there doing QA testing). So as a result, they all managed to earn status in one of the hotel programs and became pretty serious points collectors in the process. We spent some time talking about hotel points and bonus offers, and of course I told them all about Loyalty Traveler! Thank you for the informative post. I look forward to trying this new entertainment feature with my tablet the next time I fly AA. I flew this new aircraft last month and it was written on the instructions that iPhone 5 is not yet supported on this new system. @ ASW – Thanks for the compliment and thanks for reading! @ Favio Vilela – The instructions are referring to iPhone 5 and eXport compatibility. Thanks for visiting, I’m a big fan of your blog. I can’t read Portugues but I love your photos! Thanks for the very informative post. I’m on one of these great new airplanes right now (AA51) in biz seat 4G and thought the eXport was an S-Video port. It’s not labeled and there are no instructions anywhere that I have seen on this flight nor was there any on AA100 that I flew on Saturday. Was wondering why they would put such “old” tech on a new plane. Still, why use this proprietary port? At the very least, they should provide instructions and an adapter for use during the flight. While they are at it, provide a 3-prong headphone adapter too, because if you don’t have one your own headphone will not work properly and you we have to use the complimentary Bose headsets if you use the IFE. @ Tyler – Thanks for the comment! I knew that rather than using batteries, power to the complimentary Bose headphones was being supplied by a power port, but I didn’t realize that meant that you couldn’t use your own headphones without an adapter. I need to see if I can find out more about that interface and track down an adapter. Has anyone discussed whether other headsets (such as my tried and true Sennheisers) will work with the AA 777-300 jack. I’d rather not use the Bose headset provided. 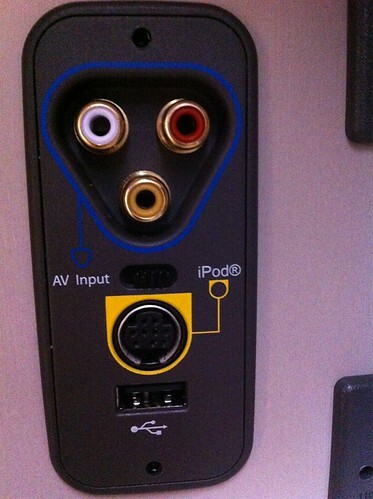 The video/audio ports are behind the times. Who actually uses phono ports now? HDMI, VGA. Tried it. Connected Archos with RCA’s. Make sure you set the little switch between RCA and Apple. Picture quality was awful, went back to laptop.